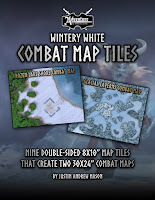 The collection of combat map tiles that I created for the "Into the Wintery Gale" series is now available for purchase. 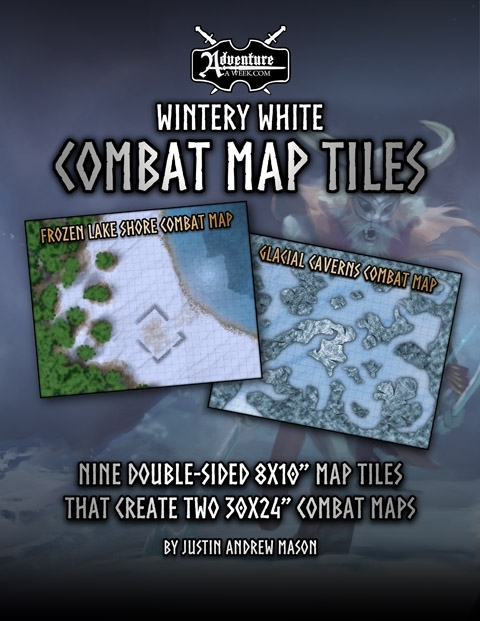 Wintery White Combat Map Tiles consists of Nine double-sided 8" x 10" map tiles that create two 30" x 24" combat maps: 1-inch scale grid maps of "Frozen Lake Shore" and "Glacial Caverns". This product can be purchased via Adventuraweek.com, DriveThruRPG, RPGNow, and Paizo.